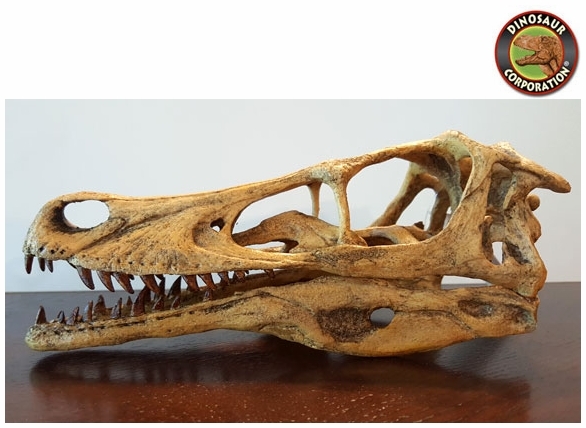 Velociraptor skull. Dinosaur fossil replica. Great Raptor Skull. On display: Paleontological Museum Mongolian Academy of Science, Ulan Baatar, Mongolian, American Museum of Natural History New York, USA., Paleontological Institute in Moscow, Russia. * Lived: 75-71 million years ago, Later Cretaceous Period, Gobi Desert of China and Mongolia. * Dinosaur dimensions: 6.8 ft (2.07 m) long, 1.6 ft ()0.5 m) high at the hip, and weighing 33 lbs, (15 kg). Velociraptor, like other dromaeosaurids, had a large manus ('hand') with three strongly-curved claws, which were similar in construction and flexibility to the wing bones of modern birds. The second digit was the longest of the three digits present, while the first was shortest. The structure of the carpal (wrist) bones prevented pronation of the wrist and forced the 'hands' to be held with the palmar surface facing inwards (medially), not downwards. The first digit of the foot, as in other theropods, was a small dewclaw. However, whereas most theropods had feet with three digits contacting the ground, dromaeosaurids like Velociraptor walked on only their third and fourth digits. The second digit, for which Velociraptor is most famous, was highly modified and held retracted off of the ground. It bore a relatively large, sickle-shaped claw, typical of dromaeosaurid and troodontid dinosaurs. This enlarged claw, which could be over 6.5 cm (2.6 in) long around its outer edge, was most likely a predatory device used to tear into prey, possibly delivering a fatal blow. Long bony projections (prezygapophyses) on the upper surfaces of the vertebrae, as well as ossified tendons underneath, stiffened the tail of Velociraptor. The prezygapophyses began on the tenth tail (caudal) vertebra and extended forward to brace four to ten additional vertebrae, depending on position in the tail. The stiffening forced the entire tail to act as a single rod-like unit, preventing vertical motion between vertebrae. However, at least one specimen preserves a series of intact tail vertebrae curved sideways into an S-shape, suggesting that there was considerably more horizontal flexibility. These adaptations of the tail probably provided balance and stability while turning, especially at high speeds.